If you’re a regular reader of my blog, you know that my boys had to fight TTTS, and it is the reason that they were born extremely premature. While they say it is rare, TTTS seems all too common to me, and I know too many people who have been affected by it. Today, you will meet just one of those families. Please meet Dakota and Scarlett. I had identical twin girls on September 25, 2016. Twin A is Dakota, and twin B who was born 2 minutes later, was Scarlett. Dakota was the bigger of the two weighing 1.22 kg, Scarlett only 1.02 kg. 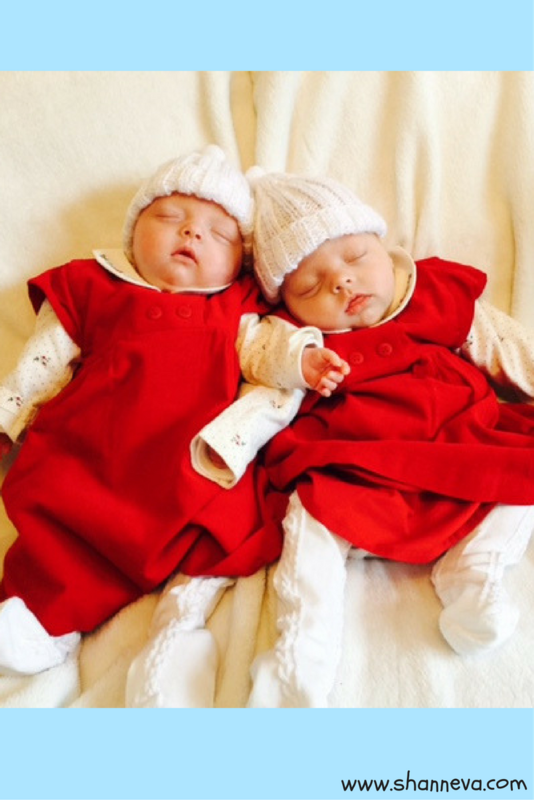 They were born at 28 weeks in King’s College Hospital, London. It was a blur, so after a week I stopped counting days. I believe Scarlett was in for about 6 weeks, and Dakota was 8 weeks. It felt like forever! The hardest parts were feeling like it was never going to end. All the while they were stuck in there, hooked up to lines, getting bloods and blood sugars taken frequently. This was the hardest part overall; the helplessness of them coming too early, and the guilt that they then had to stay in a stressful environment for so long. Of all we went through in there, their weight loss three days post birth, was the hardest. Scarlett dropped down to 800 g, Dakota 1 kg. They looked like skeletons, and I actually thought they would die. Also, when Dakota had a long line infection, she became septic. Very scary to see her swell grotesquely, and fight a nasty blood infection. Not officially. 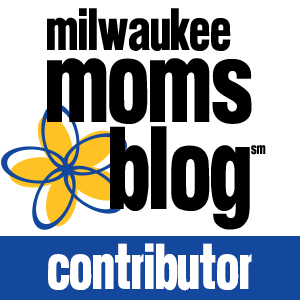 I had a complicated monochorionic diamniotic (MCDA) pregnancy. This just means I had twins sharing the one placenta, with two separate amniotic sacs. When I found out at my first scan I was having identical twins, they told me I already had a 30% chance of getting Twin to Twin Transfusion Syndrome, a rare condition that affects MCDA or higher multiples sharing a placenta. I didn’t know much about it then, until I googled it and saw so many horror stories of parents losing one or both twins to this devastating disease, or being left with permanent disabilities after birth. At 16 weeks, we found out we had the dreaded TTTS, thankfully only at stage 1. The week that followed, whilst we waited for their next scan, was the hardest of the whole pregnancy. I actually stopped loving them and tried to shut off my feelings in case we lost them. Thankfully, they stayed at stage 1 until 21 weeks when they said it had nearly resolved on its own! Unfortunately that week my stomach swelled even bigger, and became so tight. I was also having trouble breathing when I was flat because the amniotic fluid had increased so much around twin A (Dakota). At 22 week scan, I found out they had gone to stage 2. This meant Scarlett was stuck up against the wall with no amniotic fluid, and no visible bladder. Dakota was floating around in litres of fluid. TTTS occurs due to interconnecting blood vessels between both babies in the placenta. 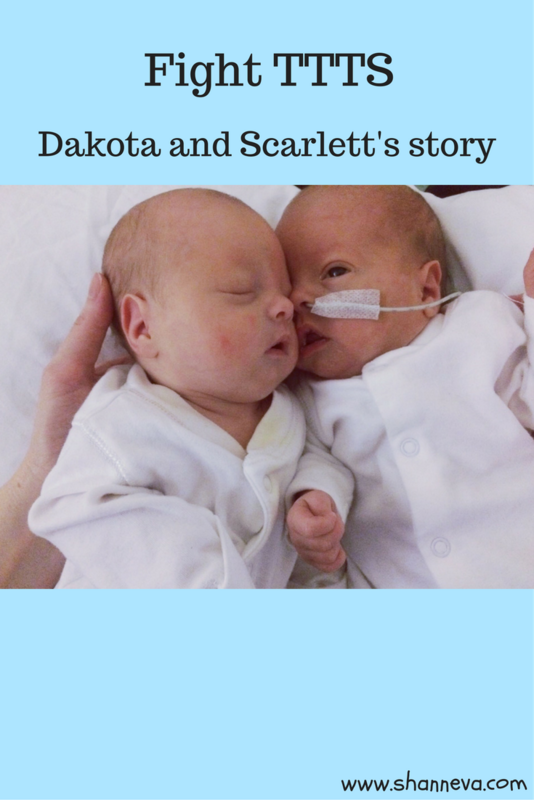 The donor baby (Scarlett) starts sending too many nutrients in the blood to the recipient baby (Dakota), causing an imbalance in amniotic fluids in both sacs, and often causing size differences, and in later stages renal, heart and neurological issues. If left without treatment, it has something like a 90% mortality rate. At the 22 week scan they offered me laser ablation surgery, by the pioneer of laser himself, Professor Nicholaides at King’s College Hospital in London. An hour later he had a laser through my stomach, and we could see the twins floating around up close! It was painful and scary but wonderful to be getting treatment from the most experienced in the world, and his colleague Dr Ioanna. The laser was successful, and two days later there was normal fluid around both babies, and Scarlett had a bladder again. I felt so much better, I lost weight as they drained off a lot of fluid at the same time. The weeks after laser were scary, as it has a high risk of preterm labour. I aimed to get to 24 weeks. I think the odds they gave us were 50% chance of at least one baby dying. Thankfully we continued on pregnant! Around 27 weeks I started losing some of my waters, and then at 28 weeks was admitted with bleeding. It turns out they think I was having a partial abruption, and I gave birth vaginally at 28 weeks. 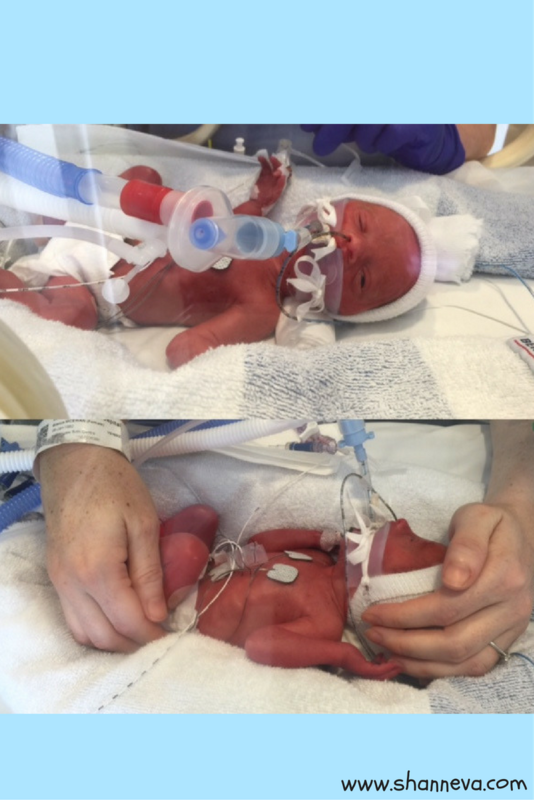 They were both born and sent straight to NICU, without any of the usual cuddles and bonding a normal birth has. I don’t even remember seeing them, only from a distance as the 25+ health professionals worked on them. They were amazing! 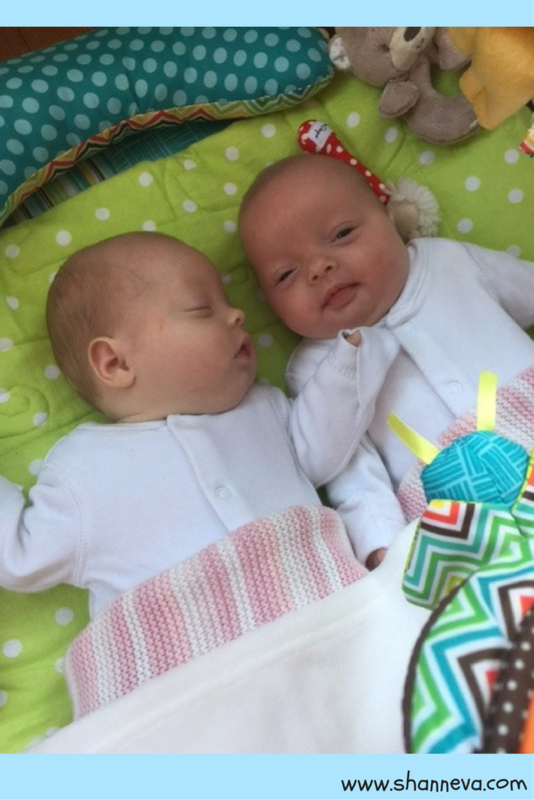 The twins are now 4.5 months actual age, 9 weeks adjusted. So far they are doing great! There doesn’t appear to be any damage that we can see from having TTTS, but only time will tell neurologically. They struggle a bit with reflux,and have a million follow-up appointments, but if that’s all we’ve got to worry about then we did really well! I’m doing much better. In hindsight, I was struggling and in need of support postnatally. Thankfully my mum and sister came to stay when they were two months old from Australia, and I’ve since got my confidence and happiness back again. I wouldn’t want to go back in time, and unfortunately I cannot say I had a good birth experience like most mums can. But my happiest day was getting them both home from NICU. The bonding began then. 5.What advice would you give to a new preemie family? It’s tough. No one will understand unless they’ve had NICU babies or extremely premature babies. It’s frustrating when people pretend to know or assume they know how you feel; they have no idea. The best thing to do is befriend other NICU parents, or look for online support groups. This got me through! I’m also an RN, so it helped medically when I spoke to doctors and nurses. If you don’t have any medical background, ask lots of questions! Don’t stew on it then google it, as you’ll just stress out too much. Be an advocate for your babies. The nurses and neonatologist are great, but they aren’t you the parent. Don’t be scared to say if you don’t understand or like something in the care or treatment. I potentially saved the life of Dakota when she was septic. No one knew she was sick except me! I said something, then the whole team came in and discovered she was unresponsive and extremely sick. Look for patterns in your babies’ obs (monitors), and if something is changing likely the baby is trying to compensate and getting to the point where they won’t be able to anymore. Most of all, just recognise that the staff are supportive, and talk to them or your family about your feelings as much as you can! Cry whenever, it doesn’t matter. NICU doesn’t last forever, so just keep that end goal in mind. Such wonderful advice. Thank you so much for sharing sweet Dakota and Scarlett with us. Please leave any supportive comments or questions below. Also, please share this post to spread awareness and fight TTTS! If you would like to learn more about TTTS, please click HERE. I remember being afraid we would lose our babies too. I think this fear was higher for me before birth than after because we lost so many babies to miscarriage. The NICU is a club that most parents never contemplate joining until they are already there and it is really unforgettable and life changing. I am a ‘member’ of that club too as we had four babies who were there. I am so glad to hear that your beautiful babies are doing well now. Thank you for bringing attention to this rare condition. The stories are always inspiring and they give me hope that the medical community continues to make advancements in the treatment. Dakota and Scarlett are miracle babies! I had never heard of TTS before. Thank you for sharing and bringing awareness to this. I loved reading about these precious babies! I cannot even imagine the struggle and am so glad they are doing so well today. I agree about the parent advocating their kids, it’s so hard because you often assume the doctors know it all, but it is definitely okay to ask questions and get those answers you need. I’ve never heard of TTS either, but I learned a lot-thank you for sharing your story! These stories are just incredible. Each time I find myself reading while holding my breath. Then the goosebumps come. These families are just amazing. Thanks for sharing their stories. These stories always amaze me, and so does the strength of the parents! What beautiful little babies. I am glad they are doing well today. It’s so important to share these stories, too, for others who might be going through the same thing. It helps to hear from someone who has been there! Wow. What little fighters. They are adorable little princesses!